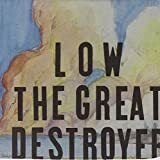 This week Robert Plant releases his latest album, Band of Joy, and oddly enough has included cover songs originally written and performed by the indie band Low on their The Great Destroyer album. This got me thinking...if you had unlimited means and could choose to commission any musical artist to cover another artist's song, what combination would you choose? To enter the contest, leave a comment in this post with the name of what would be your ideal cover song, the song title as well as the artist who would cover it. The winner will be chosen randomly at midnight CT Friday evening (September 17th).